Golf GameBook on Samsung Galaxy SIII phone. Year 2012 is almost over and it’s been a busy but great month. Today we received an early Xmas gift: our app has climbed to first place on Samsung Apps Featured applications list globally. What would be better news to start a short Christam vacation? Until now the position hasn’t been reached by any other golf app so we definitely can see this as one significant example of GameBook’s huge global potential. Nice! GameBook has been available for Android phones since April 2012. Latest update reiterated valuable extra features for every golfer – now golfers are able to share not only scores and comments in real-time during their golf round, but also pictures with our in-app camera. Kalle put his words in nice order, when he said to media that “We have worked hard on our Android application during the last few months and are very proud that Samsung has picked our application to the top of their Featured Apps List. Obviously this is great news for all golfers and a significant achievement for us, as well as an indication that golfers will get a lot of extra value for their game from our service. Golf is our common passion and we want to offer only the best for them. Couldn’t agree more. Samsung has already selected GameBook to the small group of Samsung S Suggest™ smartphone applications. The Samsung S Suggest tool detects the end-user’s interests and makes recommendations for suitable applications. Golf GameBook app was one of the selected applications and according to Samsung Nordic it has significant global potential. With Golf GameBook, golf crosses social media. Doesn’t matter where your friends are playing, you can follow their games, see their leaderboards, pictures they have taken and comment on their games – all this in real time. And that’s why Golf GameBook is a unique golf application. You’ll never miss your friends’ golf round again and they don’t miss yours – this is the best way to stay connected with your golfing friends. Unique is still unique. And there’s plenty of more good stuff coming: the pace is accelerating next year, when Golf GameBook will bring plenty of new interesting features available for the golfers around the globe in year 2013. Happy Holidays, Dear golfers! Eat well, rest a bit… and then play some serious GOLF! 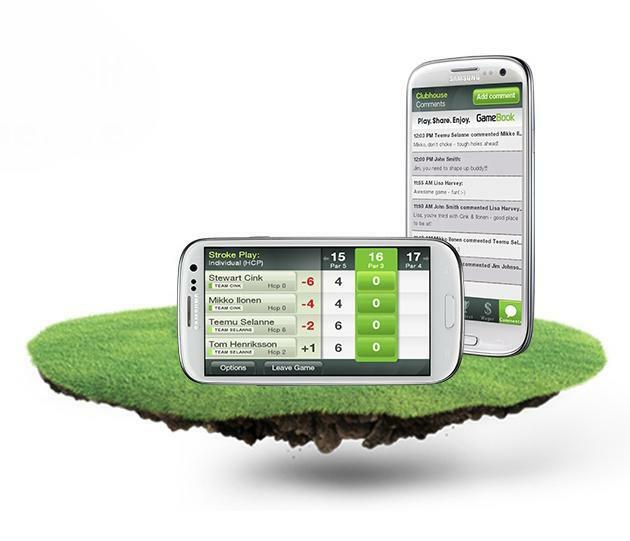 Download Free Golf GameBook App from SamsungApps now!